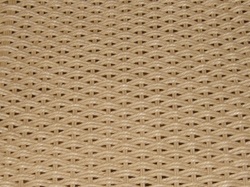 Danish cord is a 3-ply cord that comes in two textures found on Danish style furniture. Also woven in 'rush' style. We use a cord from Denmark for authentic replacement. 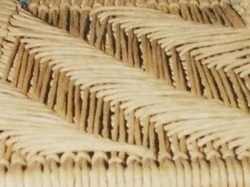 Baskets are woven from a multitude of materials such as reed, cane, natural fibers, pine needles, raffia, branches, etc. and come in every shape conceivable. 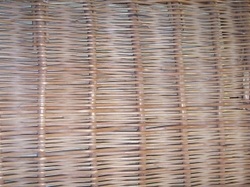 Willow can be used for seating that imparts a rougher feel but gets a fantastic patina as it ages. It is harder to work with so patterns are limited. 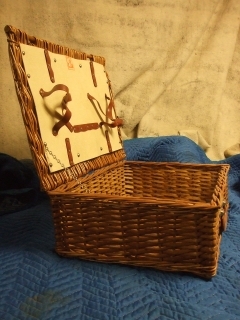 Lloyd Loom (invented 1917) is a kraft paper twisted around a metal wire and paper threads that are placed on a loom, woven into a fabric and then stretched over a wood or metal frame. Considered an all weather fabric. Painted/stained a variety colors and textures. Shaker tape is a cotton webbing, made in a variety of widths and colors. 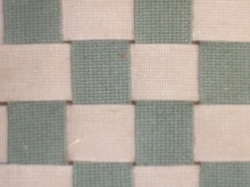 Using two colors with any pattern, you can design a custom look for your chair. 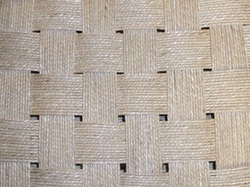 Rush, woven in a twill pattern common on Mexican furniture. Any form of rush material (or rope) can be used. 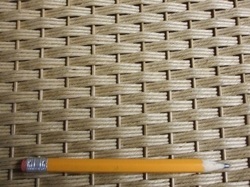 These are the most common, unique weaves we see, but there are more! If you do not see anything that represents what you have, always feel free to contact us. Even after 40 years there is always something new and different that comes through our doors. Materials always available for purchase too!